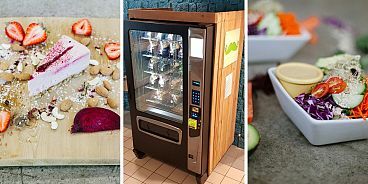 The vending machine will dispense The Green Moustache’s meals and desserts, bringing a healthy take-out option to users of the sports centre and surrounding neighbourhoods. Responding to the needs of today’s consumers for healthy, on-the-go food options, The Green Moustache Organic Café announces the launch of their first vending machine, which will be located inside Meadow Park Sports Centre in Whistler, British Columbia. In line with the current food trends, The Green Moustache vending machine will offer 100% organic, gluten-free, nutrient-rich meals and desserts, available to purchase from the machine during sports centre operating hours: 6 am to 10 pm 7 days a week. Following the success of the Meadow Park vending machine The Green Moustache plans to place vending machines in more communities across Canada, in facilities such as hospitals, schools, sports and recreation centres, and workplaces. Green Moustache Franchisees will also have the opportunity to purchase and manage vending machines in their territories. The Green Moustache Juice Co. Inc. is Canada’s only 100% organic, plant-based restaurant chain and their growth strategy includes having their nutritious meals and beverages available in every community across Canada via their franchise and vending machine programs.